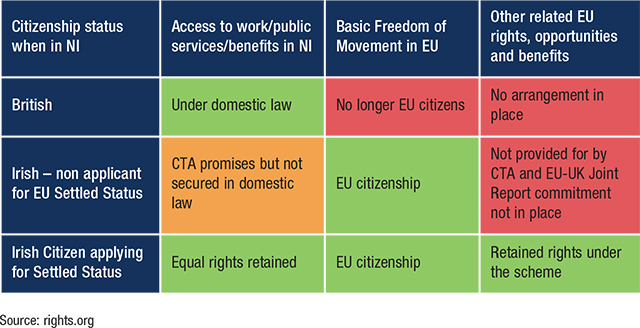 Many of the rights enjoyed by Irish citizens and Irish passport holders in Northern Ireland are underpinned by EU law. As the UK faces up to a prospect of no deal, there are mounting concerns around legal protections surrounding these rights. The Agreement has acted as the only legal foundation for some of the arrangements of the CTA, which itself has no legal establishment. Created in 1952, the CTA, as an informal agreement, sought to minimise disruption to freedom of movement for citizens between the UK, Ireland, the Isle of Man and the Channel Islands, whilst maintaining external immigration rules. As well, the CTA imposes no obligation upon members to extend a full range of civil and political rights to each other’s nationals. Instead, the CTA exists in law insofar as it is “provided for by domestic legislation” on core issues. However, many of the CTA-related measures mentioned above are instead underpinned by EU law. The British Government has given some recognition to the absence of a legal standing for some rights across Ireland. The EU Settlement Scheme for example, which allows EU citizens in Northern Ireland to retain a number of EU rights, has legal basis within the withdrawal agreement. 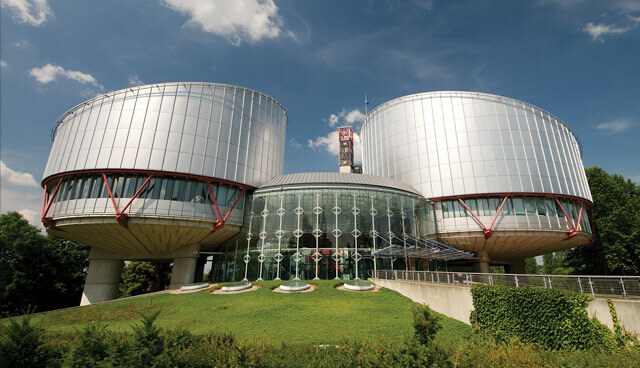 However, with the withdrawal agreement subsequently rejected by parliament in Westminster and the prospect of no deal looming closer, there are concerns around rights. 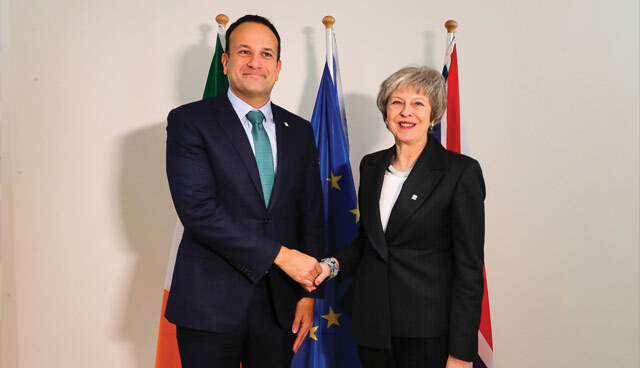 Recently, the Irish and UK Governments agreed a deal that will see British and Irish nationals living and working in each other’s countries right’s protections post-Brexit, in whatever form that takes. The deal allows social welfare contributions paid by nationals in one country to be used to meet eligibility criteria in the other. Other agreements covering aspects of the CTA are also said by British officials to be well advanced. Daniel Holder, deputy director of the Committee on the Administration of Justice (CAJ), raises a number of significant points on this issue. He highlights that the EU Settlement Scheme drawn up by the UK, facilitating EU citizens to continue living in the UK, states that Irish citizens may be able to stay in the UK without applying. However, the option to retain EU rights won’t be open to any Irish citizen who ‘arrives’ in the UK after Brexit day. This he argues has the potential to create an entitlement barrier between generations. The main argument is that while the UK advise that Irish citizens do not need to apply for the scheme, there could be reason for doing so given the potential disparity in rights afforded once the UK leaves the EU. One example is that legally, EU law and not the CTA enables Irish citizens to re-enter and reside in Northern Ireland, meaning Irish passport holders living in Northern Ireland are not legally protected to re-enter Northern Ireland if they leave. This, Holder argues, is a result of the UK never bringing its immigration and nationality laws in line with the GFA. The Immigration and Social Security Coordination (EU Withdrawal) Bill was introduced in late 2018 to try and remedy this, however, other areas remain exposed. Holder argues that the current outworkings of Brexit manages to “make every group a second class citizen in some way”, which he believes undermines the GFA’s intention to prevent any detriment on the basis of identity choice. For example, cross-border care relies on Irish, UK and EU funding. If funding is removed, then policy decisions could see a move towards the removal of healthcare for non-residents in using domestic resources. While some cross-border care is currently funded by Irish and UK health authorities alone, a significant portion is made feasible by EU funding programmes. Without that EU funding, new policy choices on funding would need to be made in both Ireland and the UK to continue to fund healthcare for ‘non-residents’ using domestic resources. Without continued EU funding, the services in question may either no longer prove tenable, or may need to be privately paid for by patients instead. MPs in Westminster have indicated their desire to see no deal taken off the table. However, there is no guarantee this will happen and without a legal framework between the UK and the EU, and a question mark hangs over some existing citizen rights. 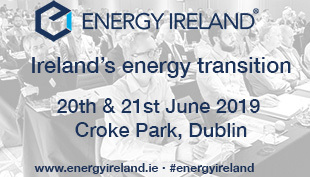 In order to fully address these issues post-Brexit, the UK and Ireland require a bilateral agreement covering both the core and related issues of the CTA, while considering other areas designated by the GFA for cross-border cooperation. While both governments have voiced their desire to implement such an agreement, the terms have not yet been agreed.